Syracuse center Bourama Sidibe goes up for a shot against Pittsburgh. Mandatory Photo Credit: Kicia Sears, The Juice Online. Syracuse will try to rebound from an ugly loss against Florida State when they host Boston College on Saturday afternoon at the Carrier Dome. Ahead of the game, The Juice Online’s Steve Auger and Wes Cheng give their predictions below. STEVE AUGER (Season Record: 1-0): These two teams recently squared off at Conte Forum, a 77-71 Syracuse win. A game in which some brilliant scribe correctly predicted the score, but I digress. The story of that game was Syracuse doing its best impression of the Golden State Warriors. The Orange connected on 55.8 percent of their shots, a 29-of-52 clip. And Syracuse was an impressive 11-of-26 from three-point land. 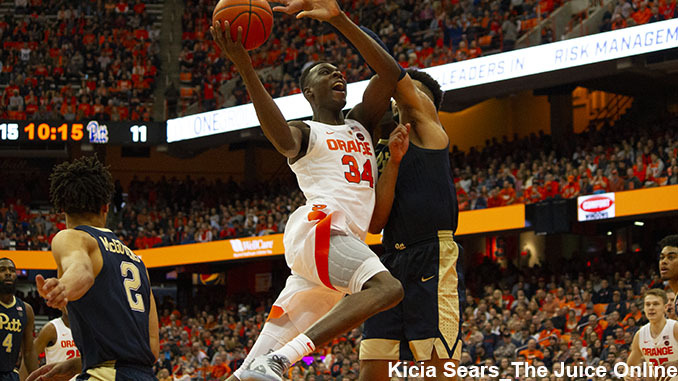 Tyus Battle played the role of Steph Curry with 31 points while handing out six assists. Battle was one of only three Syracuse players in double figures. Buddy Boeheim contributed 13 points off the bench while Elijah Hughes finished with ten. Not to be outdone, BC’s Ky Bowman and Jordan Chatman each tallied 21 points for the Eagles. The pair knocked down seven of BC’s nine 3-pointers and was a combined 11-for-11 from the free throw line. BC followed up the loss to Syracuse by dropping a home game to Notre Dame and then getting thumped by 25 points at Duke despite leading by a bucket at the half. The Orange, meanwhile, completed the season sweep of Pitt with another road win before returning home for a contest with Florida State. Syracuse should’ve stayed on the road as the Seminoles used some lights-out shooting from beyond the arc to race out to a 22-point first half lead. The Orange cut it to two points in the second half but ran out of gas as FSU pulled away for a convincing 80-62 win. Both SU and BC will be looking to rebound from abysmal losses. Along with big games from Bowman and Chatman, to return the home loss favor to the Orange, BC will need someone else to provide some additional scoring punch. The Eagles will also need to prevent Battle from running roughshod, despite having no one that can guard him. Battle won’t need to shoulder such a heavy scoring burden in this one as Hughes, Oshae Brissett, and Frank Howard should rebound from fairly pedestrian performances the first time around. Don’t expect Syracuse to shoot lights-out again in the rematch, but don’t expect them to drop a home game to BC either as the Orange win it, 74-63. WES CHENG (Season Record: 6-4): In the two previous ACC games Syracuse has lost this season, the Orange has rebounded in the next game. In SU’s first conference loss of the season, the Orange shot an abysmal 31 percent from the field in an ugly loss to Quad 3 team Georgia Tech in a 73-59 loss. What did Syracuse do in its next game? It took down No. 1 Duke on its home floor, shooting 43.8 percent from the field and 11-25 from downtown. Similarly, the Orange was thumped by Virginia Tech in its second ACC loss of the season, shooting just 36.4 percent from the field. In a rebound performance on the road against Boston College, the Orange shot 55.8 percent from the field and 11-26 from downtown. Let’s see if there’s a pattern. Syracuse was ice cold from downtown against Florida State on Tuesday in an 80-62 loss, shooting 5-20 from beyond the arc. I expect the Orange to shoot better, with Boston College ranked 175th in the NCAA in adjusted defense according to KenPom. Syracuse will struggle out of the gates before finding its rhythm, holding a lead for most of the second half in a 71-63 win for SU.